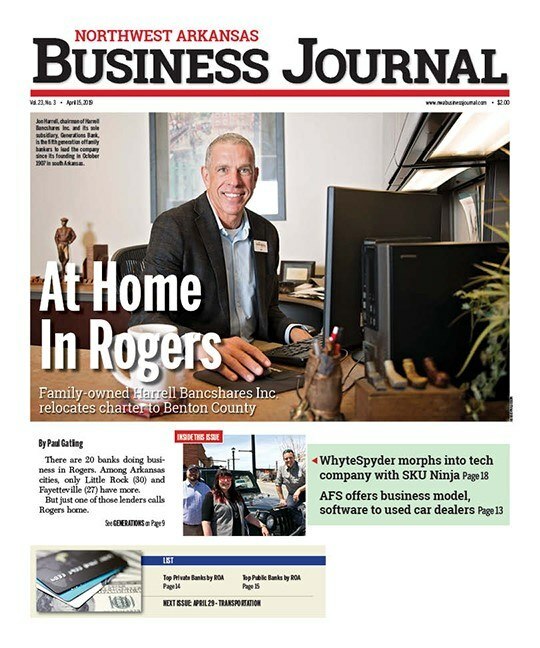 White River Bancshares Co., the holding company of Fayetteville-based Signature Bank of Arkansas, reported Monday (April 15) that first quarter net income was $1.166 million, up from $1.096 million during the same quarter of 2018. The over-the-counter (OTCQX: WRIV) publicly held company posted full year 2018 net income of $4.569 million, up from the $3.036 million in 2017. The bank holding company ended the first quarter with assets of $648.703 million. The bank, founded in 2005, also has locations in Bentonville, Brinkley, Fayetteville and Springdale. Following are other items from the bank’s first quarter report. • The bank ended the quarter with cash and cash equivalents totaling $31.922 million, down from $42.279 million at the end of the first quarter of 2017. • Net loans of $527.41 million at March 31, an increase of 5.22% from March 31, 2018. • Total deposits of $535.04 million at March 31, an increase of 5.11% from March 31, 2018. • Non-interest-bearing deposits increased 25.09% to $110.4 million at March 31, 2019 compared to $88.26 million a year ago. • Non-performing assets at March 31, improved to 1.18% of total assets from 1.73% a year ago.